Concerns about the medicalization of childbirth and struggles to maintain ‘normality’ in labour have been at the forefront of debate within the discipline of midwifery since the 1980s. The achievements of modern medicine, with their undeniable benefits, have given rise to new challenges for midwives trying to maintain normality and prevent unnecessary intervention, and also risk disempowering women by denying them the opportunity to give birth naturally. But these contemporary concerns are not entirely new, closely resembling the situation in conflict-ridden 18th century London, where five female midwives were fearlessly contesting professional competition from inexperienced male doctors. Jane Sharp (1671), Sarah Stone (1737), Elizabeth Nihell (1760), Margaret Stephen (1795) and Martha Mears (1797), the only known female midwifery writers in English before 1800, varied greatly in their professional background, scope of practice and writing style but they all shared a passion for midwifery, conviction in their beliefs and a woman-centered attitude to childbirth. These midwives fought to maintain what were the core values of midwifery then, as they are now; a belief in the power of the female body, a trust in nature and the quest to sustain normality in labour. While skilled in managing emergencies in childbirth, they all held that the great majority of labours were safe and ‘easy’ in the hands of a well-trained midwife and, so, while not afraid to intervene where necessary, they remained highly sceptical of what they saw as the rash interventionist approach of the inexperienced male doctors of the time. Elizabeth Nihell was born in 1723 in London to a family of French Catholic descent. She trained at the prestigious Parisian Hotel-Dieu Hospital, before spending the majority of her professional life practising in London’s Haymarket and, in 1760, publishing ‘A Treatise on the Art of Midwifery Setting Forth Various Abuses Therein, Especially as to the Practice with Instruments’. Practising at a time when female midwives faced severe professional competition from male doctors, Nihell threw herself into the frontline of this battle of the sexes being fought over who should attend women in labour. She firmly believed in female midwives, with their inborn aptitude, empathetic approach and nature-friendly practice, over male practitioners, who she saw as too keen to intervene in order to show their ‘superiority’ over women through crude attempts at early intervention, particularly through the use of forceps. In her treatise she argued that ‘natural’ and ‘easy’ births were common and that childbirth was generally safe, becoming dangerous mostly through unnecessary intervention. In these common cases she argued that there was little for the midwife to do other than support the mother and receive the baby; “Nothing can be more important to the well-being of the patient, than for non-violence to be used to Nature, who loves to go her own full time, without disturbance or molestation” (1760: 257-9). She thus expresses concern that a growing group of, mostly male, midwifery writers of the time saw difficulties where there were none, citing complications such as a foetal head too large and a reproductive passage too narrow as insurmountable, when in fact the case is far from being so. These doctors severely underestimated the natural ability of the foetal skull to mould itself to the passage and the remarkable elasticity of the cervix and female reproductive tract. Despite this view that easy delivery required no extraordinary assistance, Nihell’s time at the Hotel-Dieu Hospital provided her with extensive practical experience and a remarkable set of clinical skills, of which her published work is ample evidence. Her training in Paris also appears to have strongly impacted on the development of her philosophy of childbirth and her model for the discipline of midwifery, which so mirrors the contemporary view. She expresses very forward-thinking attitudes throughout her published work, for example, in advising mothers to breastfeed their babies themselves, blaming the fashion of wet-nursing for high rates of infant mortality. She also made pertinent observations about the psychology of childbirth, highly relevant in both her own and the current century, reflecting the concerns of many of today’s midwives about the over-medicalization of labour. She recognised the vulnerability of a woman in labour who sees herself as too much in the power of their male doctor to dispute his judgement. He, perplexed, impatient, or not knowing what better to do resorts to forceps, which Nihell repeatedly refers to as ‘fatal instruments’, and the “temptation… of a quick riddance from a violent state of pain, is too great” overpowering the woman’s actual wish to resist (1760: 159-63). In her assault against these inexperienced male practitioners she did not hold back and was particularly sharp-tongued when it came those she termed the ‘disciples’ of the Scottish obstetrician and inventor of obstetric forceps, William Smellie (1697-1763), who history has painted as a particularly odorous character who is alleged to have been involved in murdering, or at least showing callous disregard for where the pregnant corpses he studied came from. She described these as “self-constituted men-midwives made out of broken barbers, tailors, or even pork-butchers (“I know myself one of his last trade, who, after passing half his life in stuffing sausages, is turned an intrepid physician and man-midwife”) (1760: 71). Above all Elizabeth Nihell was a pro-woman midwife, fighting tirelessly for the rights of women to maintain their professional status and prestige as midwives and to reinforce every woman’s confidence in her own body and the reproductive powers of nature. However, in the dedication of her published work she writes “the subject of the following sheets is of such universal importance, that it would be difficult to name that human individual, to whom it does not in some measure relate”. It is very possible that it was this overwhelming dedication to the universally central discipline of midwifery that led to Nihell making heart-wrenching sacrifices within her personal life. She was deserted by her husband, a surgeon and apothecary, and spent the final year of her life in a workhouse in St. Martin-in-the-Fields. This remarkable champion of female midwifery died in 1776 and is buried opposite today’s Charing Cross Station. Bosanquet, A (2009). Inspiration from the Past (1). Jane Sharp. The Practising Midwife vol. 12 (8): 33-35. Bosanquet, A (2009). Inspiration from the Past (2) Sarah Stone, the Enlightenment Midwife. The Practising Midwife vol. 12 (9): 31-32. Bosanquet, A (2009). Inspiration from the Past (3). 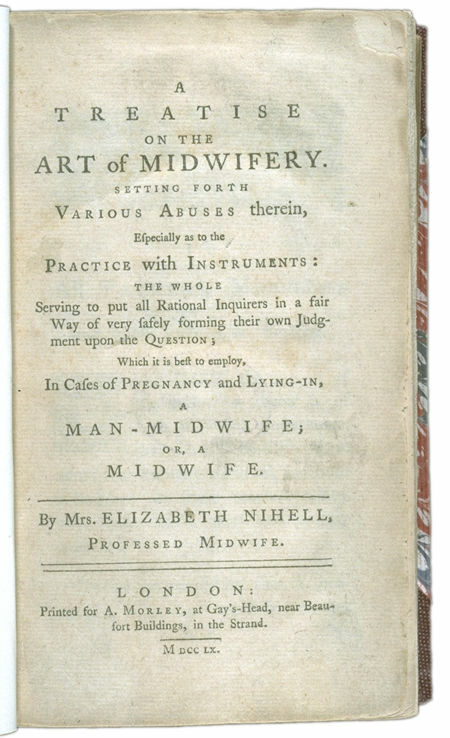 Elizabeth Nihell, the ‘anti-obstetric’ midwife. The Practising Midwife vol. 12 (10): 46-48. Bosanquet, A (2009). Inspiration from the Past (4). Margaret Stephen, protector of the profession. The Practising Midwife vol. 12 (11): 31-32. Bosanquet, A (2010). Inspiration from the Past (5). Martha Mears, nature worshipper. The Practising Midwife vol. 13 (1): 34-36. Nihell E (1760). A Treatise on the Art of Midwifery Setting Forth Various Abuses Therein, Especially as to the Practice with Instruments, London: A Morley.